Scientists from the Florida campus of The Scripps Research Institute (TSRI) have found that one of the most widely prescribed pain and anti-inflammation drugs slows the growth rate of a specific kind of cancer in animal models and suggests the medication could have the same effect on other types of tumors. The new study, published online ahead of print by the journal Cancer Research, focused on the effects of celecoxib (Pfizer’s Celebrex®). Celebrex® targets an enzyme called “cyclooxygenase-2” (COX-2), which is linked to pain and inflammation. This enzyme is also critical in the creation of prostaglandins, compounds that act like hormones and play a role in promoting tumor growth. COX-2 expression is typically low in normal tissue, but high in multiple types of cancers. 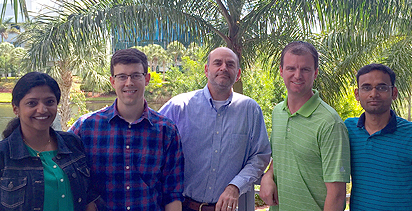 Authors of the new study included (left to right) Smitha Kota, William Guerrant, Joseph Kissil, Scott Troutman and Vinay Mandati. The researchers went on to conduct animal studies tracking the effects of celecoxib on the growth of cancer cells from a tumor type known as neurofibromatosis type II (NF2). In humans, NF2 is a relatively rare inherited form of cancer caused by mutations in the anti-tumor gene NF2, which leads to benign tumors of the auditory nerve. Animals received a daily dose of the drug, and tumor growth was followed by imaging. Analysis of the results showed a significantly slower tumor growth rate in celecoxib-treated models than in controls. Using various approaches, the new study also showed that a signaling cascade known as the Hippo-YAP pathway is involved in these results and that the protein YAP is required for the proliferation and survival of NF2 cells and tumor formation. In addition to Kissil and Guerrant, other authors of the study, “YAP Mediates Tumorigenesis in Neurofibromatosis Type 2 by Promoting Cell Survival and Proliferation through a COX-2–EGFR Signaling Axis,” are Smitha Kota, Scott Troutman, Vinay Mandati and Mohammad Fallahi of TSRI; and Anat Stemmer-Rachamimov of Massachusetts General Hospital. The work was supported by the National Institutes of Health (grants NS077952 and CA124495). Guerrant is also a recipient of a Young Investigator Award from the Children’s Tumor Foundation.